Introducing the Epic Cards Power-Up! We are excited to announce that our new Trello Power-Up is now available! It is a free add-on for Trello that adds an epics support for your Trello boards. Epics are a great way to organise and track your work towards some bigger goal. If you’re new to epics, here’s a good tutorial to learn more. It’s a standalone Power-Up, which means that it runs entirely within Trello and there is no 3rd party server in place. You don’t have to be concerned about data leakage as your data stays in Trello. It also made it possible for us to make this Power-Up free. After all, it's just a single feature so we think it should be free. You can install the Epic Cards Power-Up for your board at the Trello Power-Ups directory. Why would you need epics support in Trello? These are the main themes of the project, or epics in our vocabulary. All the cards belonging to those epics are added to the respective lists. Continuing our example, let’s say you also want to clean the coffee machine, organise the kitchen cupboards, and wash the windows. You’d add those to the list. And still few more. At some point you realise that your lists have become very very long, to the extent that they’ve become unmanageable. You can always split a long list into two or more separate lists. But sooner or later you end up having too many lists in your board so that you can’t see them without a lot of horizontal scrolling. Sounds familiar? The board in the above picture is an ideal Trello board in the sense that you can see all of the lists at once, and all of the cards in those lists since none of the lists is very long. That might be realistic for a spring cleaning project. But it’s not so realistic for a software project. 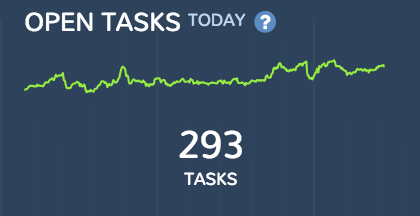 Our team has currently 293 open tasks in our backlog boards! How do you manage that amount of tasks without getting lost? We have tasks scattered over multiple boards. Once a task is ready for work, it is moved to the sprint board. That’s all fine. The problem is that I need someplace the plan our upcoming releases. I want to pick tasks from various boards and group them together so that they form a larger body of work. I want to assign it a name such as “User access control and GDPR compliancy”. These larger bodies of work, or epics, consist different types of tasks, some of them are programming, some of them are content production or marketing related. That’s why they “live” on different Trello boards. But they all should be managed as one unit so that we can have a new release of our software which contains all of those tasks completed. I want to assign them into an epic without moving the cards into another list or board. For example, we have a board “bugs”, which contains all the bug reports. I want to assign some of those bugs to be fixed on a certain epics but I don’t want to move them away from the bugs board since I want someplace where I can see each and every open bug at once. The problem is, there is no mechanism in Trello that would allow to group tasks together while keeping them in different boards. Sure, you can link cards between boards, but that doesn’t scale well to the amount of tasks that we’re talking about. I don’t blame Trello for that. Our use case is not the most common use case among Trello users. Not everyone is using Trello for tracking software releases. I get that. Actually, I’m also benefiting from that aspect of Trello. Because it also means that I don’t have to see all kinds of features that might be relevant for someone else but not me! Fair enough. But back to our problem. So we had hit the limits of what can be done in Trello. You can do plenty of things with Trello. And with unbeatable usability. But if you start diverting away from the typical use case, chances are that you’ll be hitting a wall sooner or later. While there are plenty of tools in the market that are specifically tailored for our use case, we didn’t want to switch the tool. Trello is awesome. Besides, Trello is extensible via the Power-Ups platform. So why not implement a solution to this problem. That’s what we decided to do. How did we end up to the current solution that we have now introduced? Did we face any obstacles in the way? These might be topics for a follow-up post. Let’s see. Stay tuned and feel free to share your 2 cents in the comments section. Learn more about the Epic Cards by Screenful and give it a try on your Trello board. Please do not hesitate to contact us any time at hello@screenful.com if you have questions or feedback. You can also follow us on twitter or Facebook.